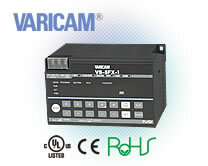 VS-5F is Standard VARICAM series with cam switch on/off output. 8 programs×24 switches, current position BCD output. 16 programs×40 switches or 32 programs×24 switches, current position BCD output. - 3 points 4/5 points Inputs the exteral program No. - 1 point - Used to prevent the current position value from changing when controller reading occurs. - - 1 point Input to prevent current position from changing or for origin setting. 1 point 1 point 1 point Input to cancel an error display. 1 point 1 point 1 point Switch signal will be output only upon the input of this signal. 1 point 2 points 1 point 60, 180 or 360 pulse signals will be output per rotation, or ON/OFF signal will be output based on the speed setting value. 1 point 1 point 1 point Outputs when controller and sensor are functioning normally. - 3 points 4/5 points The currently selected Program No. is output. - 11 points 11 points Current position (3-digit BCD + 0.5-deg display) signal will be output, or rotational speed will be output in binary code. - 1 point 1 point Outputs a timing signal which ensures that the current position is read in a stable condition.